mwe3: Im so glad you were able to release a follow up to your 2016 Shining Pyramid self-titled debut album. What lessons did you learn from your first album and how did you want Children Of The Stones to sound different from the first Shining Pyramid album? Nick Adams: First of all, thanks for taking an interest in our latest release. I dont think we made a conscious decision to do anything different with this album. In fact parts of "Sungates" may even date from when we were recording our debut. We keep buying new kit, so thats where the new sounds come from. Peter Jeal: Yes, thanks for including us in your mission Robert! There wasnt a conscious effort to revise the sound but I certainly learned many lessons during the production of the first album and almost enjoyed that stage, not being so bogged down with the mechanics of Cubase. 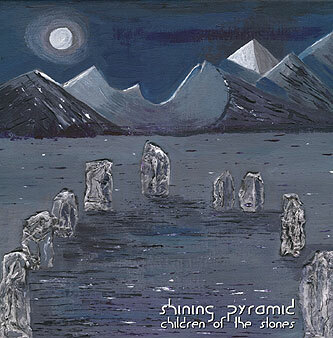 mwe3: Was there a difference in approaching the writing and recording the first Shining Pyramid album with Children Of The Stones and do you feel theres been a kind of evolution in approaching both the songwriting and recording between the two albums? 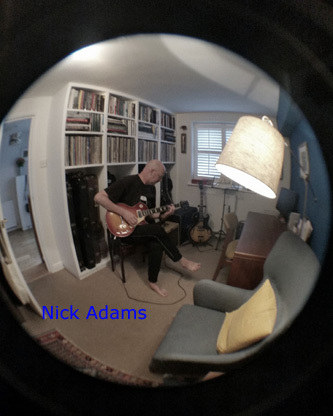 Nick Adams: I think the only difference is now we know that we can actually put together an album and that people will listen to it and respond to it and that has made us try to be the very best we can be. The recording process is basically the same and the ideas come from just sitting down and playing. Ive never been one for playing covers, well not since my teens anyway. Peter Jeal: I agree, were more familiar with the operational side and can focus on what matters  the music. Also, the positive response of the first album gives me confidence to trust in what sounds right; belief in our sound. mwe3: I was thinking Stonehenge when I saw the cover art of Children Of The Stones then I thought you are both fans of the Rolling Stones and probably their more progressive, experimental mid to late 1960s era. Was there a deliberate attempt to mix vintage psychedelic rock imagery with futuristic New Age synth-sonics on Children Of The Stones? Nick Adams: I think that mixture of rock style guitar and synth is what makes us sound the way do. The idea of synths being somehow futuristic still persists but the solid body electric guitar predates the synth by about 15 years. The name of the album comes from Peter, although youre not the only person to think theres a connection to the Stones. 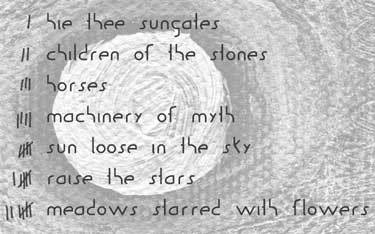 mwe3: The Children Of The Stones album leads off with a track called Hie Thee Sungates, which has a very proggy sounding title. Did you want to lull the listener in with a steady stream of sonic invitations? Is this the calm before the storm and what can you tell us about the song title? Its very English to my eyes and ears and the track also has a cool, calm and collected West Coast feel to it. I mean American west coast! Maybe its the soundtrack style of the track that hit me. Nick Adams: We thought "Sungates" was a strong opening track, and were still interested in ambient sounds and wanted to bring the listener on board gently. The fact you mention a West Coast feel is interesting... we thought it had a 'summery' sunny kind of vibe too. Peter Jeal: Nick suggested it for the opening track and it immediately seemed right. It has quite a gradual build and yes, I like the word invitation. The track title means hurry toward the Sun and I think of it as a gathering and preparation, perhaps with an offering to a watchful spirit, on to the days journey. mwe3: The first track makes a perfect segue into the title track Children Of The Stones. Is there a double metaphor meaning to the song title? Its a very calm and sedate sounding track, almost despite the heavy dramatic mellotron sounds. I was thinking Brian Jones might like this as he was so into the tron and I also thought of Mike Pinder, who brought the tron into the rock arena in mid 1966. What about the Tron sounds and would you describe the title track as being New Age Rock or does that not offer a comprehensive enough description? Its very glacial like in its musical movements. Nick Adams: It is quite a slow track isnt it? But that may be because apart from the very beginning the Mellotron sound is in fact an effects pedal - the Mel 9. So its actually a guitar. In my excitement with having a new toy I kind of threw the kitchen sink at it and layered three or four tracks and then Peters soloing on top. That pedals great, Ive always liked Mellotron, the wonky tape not sounding quite right but having its own quality. I would have first become aware of the Mellotron through listening to the big prog acts of the 70s but We Love You by the Rolling Stones is a wonderful track. Was that Bill or Brian? I like the idea of Brian Jones approving. Peter Jeal: Theyre on their way now, a little apprehensive but the lead mystics maintain an unwavering pace. My love for the Mellotron comes from early Tangerine Dream. The string sounds were so distinctive I never associated them with strings at the time and lacking curiosity, I just accepted what I heard, while the flutes with perfect reverb seemed so natural. Only later, on hearing the intro to Strawberry Fields Forever, did it dawn on me that these werent just flutes... there was something else going on here. mwe3: Horses is my favorite track. I was just blown away by the magnificence of the melodies. Does that track introduce the instrumental rock side of Shining Pyramid into the mix... and why horses? Are they the most majestic of beasts and is there a connection to eastern astrology regarding the title? What really impressed me about Horses was the dramatic shift in tempo and attack as the rock elements are introduced around the halfway point. Did you want to show the two distinct sides of Shining Pyramid on Horses? Nick Adams: We thought the track sounded like galloping horses and that the people who created our stone circle would have had horses and of course we have the ancient white horses carved into the hills in this part of the world. We have our own not quite fully realized Shining Pyramid mythology, a world in which the subjects that interest us are manifest. Wed like to do some heavier sounding material in the future but the pastoral kind of sound alludes to the pre-industrial age that interests us. Peter Jeal: I think theres a danger one can get seduced by the convenience that powerful software offers. One can quickly copy and paste a few bars into the framework for a track and before you know it, youre done. Throwing in a tempo change is just one way to make it a bit harder and IMHO a bit more interesting. The track title just seemed to fit the rhythm - there they are grazing contentedly, then, well rested, away on a gallop. They stop for a breather and theyre off again. mwe3: Machinery Of Myth has a great sound and is an interesting title too. Is that the most sedate or introspective sounding track on Children Of The Stones or is it a kind of mid-point breather in the festivities? Nick Adams: Thats another of the older tracks. I like it because it has a very different sound. All the tracks are a bit different which is something Im very pleased about and we thought a lot about the running order. Peters synth work is pretty remarkable and a huge part of the Shining Pyramid sound. Im afraid I lifted the title from a book by Emyr Humphries - it appealed to me. 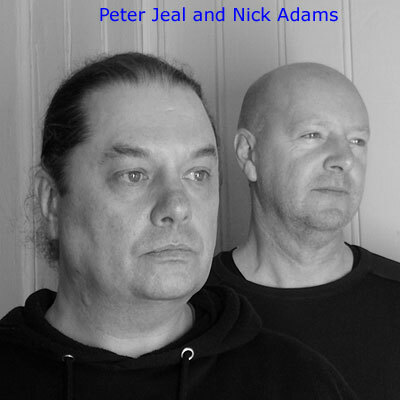 Peter Jeal: Sos your guitar work Nick! But this track started off life with some synth sounds from Nick. I like how the 5/8 tempo begins gently, quite indistinct, masking where the down beat is, so the track drifts along. But trouble brews and by the end its banging the table as if to wake you from slumber. And maybe thats the machinery of myth, the process. We go about our everyday tasks until something unexpected happens and we need it explained. mwe3: Speaking of Brian Jones, I think Sun Loose In The Sky is the most rocking track on Children Of The Stones. Did you want to cut loose with something completely different in sound and scope and what do you want listeners and fans to know about Sun Loose In The Sky, in that it represents a completely different edge to Shining Pyramids sonic arsenal. What can you tell us about the guitars that are on that track and something about how the song was recorded, for example was it cut live or with overdubs, etc? Nick Adams: That track started as a bass riff. I thought it had some merit, recorded it and added two more guitar parts all basically playing the same riff. I didnt think Peter would be interested in developing it but he liked it too. However, all that remains of my original recording is one guitar part! I used my 1973 SG on that one. Thats fairly illustrative of the way our pieces are put together. It might start in one place but end up somewhere else. Peter Jeal: This is a fun track and even druids like to party. Were really keen to have a mix of styles and energy in an album. Its more interesting for us and the listener. I hope he or she doesnt know what to expect at the start of each track but knows it was us by the end. Some tracks go through a number of iterations but I think this only took a couple as its telling a simple tale. mwe3: Raise The Stars is another long form track that travels a wide sonic terrain that mixes synth elements with a fierce and dark prog-rock edge. Is Raise The Stars the most enigmatic track on Children Of The Stones and on Raise The Stars did you want to conjure up a more mysterious track than some of the other songs? Nick Adams: I like that you say conjure up! "Raise The Stars" is one of my favorite tracks and is unlike anything weve done before. It began as an improvised piece using the Big Sky reverb pedal. It sounded like an incantation to us. We imagined a gathering at the stone circle with the sun coming up but wed already used sun twice in titles so opted for stars instead. Rather prosaic, but there you go! It is a different sound but thats something were very keen on, each track offering a different sonic experience. Peter Jeal: Yes, youve captured that well. I enjoyed the atmospherics Nick summoned here, which along with the percussion and discord suggests an increasingly frantic and frenetic ceremony leading to solace on an island of repose. The druid knows the celestial movements well and presents himself as channeling the energy of his followers to bring about the inevitable. Does he believe it? Is he a fraud? Or is he part of that mechanism? mwe3: Does Meadows Starred With Flowers serve as a kind of coda to the close of the album? Its a very unusual sounding track with a very percussive edge to it. Tell us about the percussion and overall edginess of Meadows Starred With Flowers. Theres a solid kind of rock beat in place with a sort of Tangerine Dream meets Explosions In The Sky kind of vibe. Is that track the perfect showcase for the synth sounds Shining Pyramid is known for and did you want to close the Children Of The Stones album with that track because of its power and glory? Nick Adams: "Meadows" started life with a drone from Peter that was like an air-raid siren and was quite aggressive so I added some jangly percussive guitar to it and it turned into a dance track. 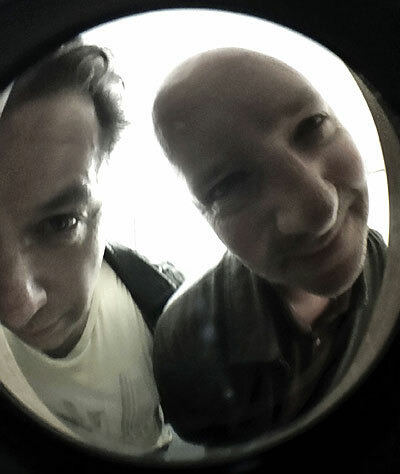 We like to finish our albums with upbeat tracks that are a bit sinister. Peter Jeal: Its interesting that the drone on its own is quite harsh with the kind of harmonics that distort what you hear long after its finished. But the guitar tames it and the track becomes almost jolly. Still, the drone is there, nagging. On paper I wouldnt expect it to work but I think it does... maybe because there are almost two experiences at once so the listener chooses which frame to listen to at any time and then its a different listen every time. mwe3: So now with the brilliance of Children Of The Stones are you proceeding into new sonic terrain and the next adventures? How will you ready the world for the majesty of Shining Pyramid? Nick Adams: Were already working on a new album, its going to be called Trees. As I said before, we might do some heavier sounding material. Were developing all the time but its a natural development... were not going to force a change of direction. Itll be a sonic adventure for us too. Peter Jeal: Indeed, well find out the direction after were there. I expect itll be still grounded in these isles and in the times where science hadnt hunted magic down to extinction. I do like the idea of doing something more clinical and percussive, with a more classical development of melody but that may end up a different project of its own. Well see!